If you have ever steered away from having a glass table top as you've been worried about it being fragile, it's time to reconsider! 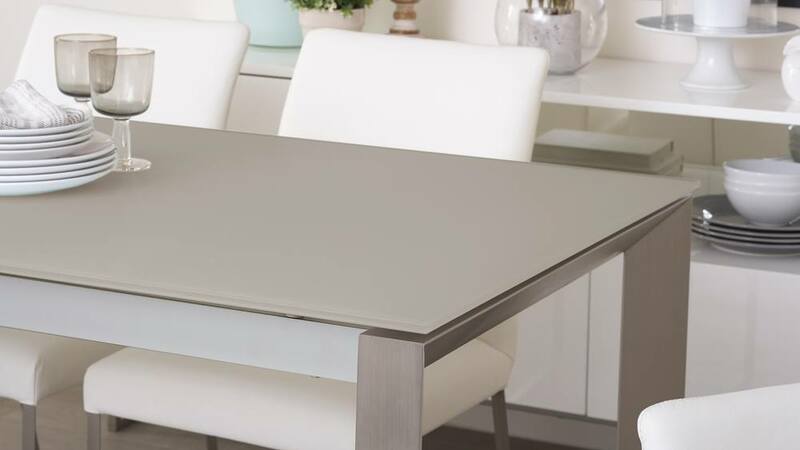 Our Eve Frosted Glass Extending Dining Table in Grey and Brushed is incredibly strong and durable, given that it's so slim and sleek in appearance. The frosted glass surface creates a beautiful soft focus while the neutral tone of the grey colouring adds a hint of warmth. 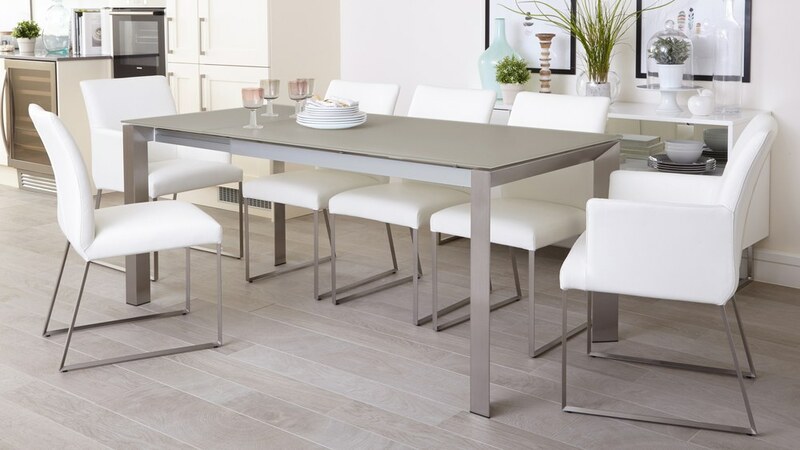 The brushed metal legs are a great coordinating feature, making this table very easy to pair with other finishes in your home. 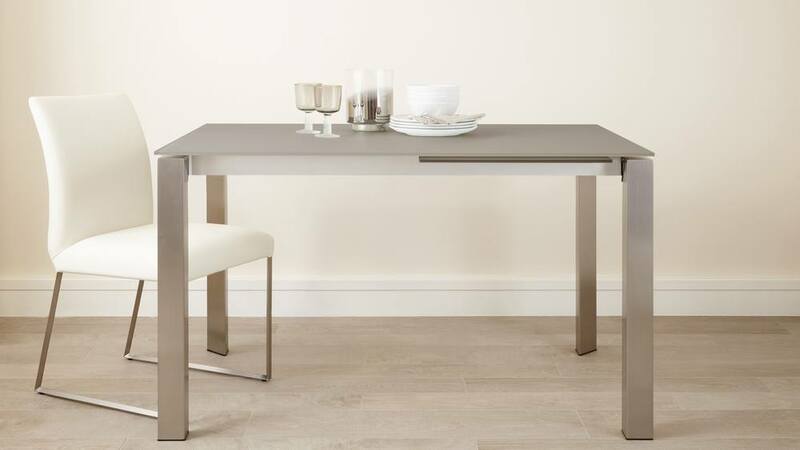 The extension used on Eve table is an Italian quality aluminium extending mechanism. It is stored within the table and pops in and out with almost spring-like ease. 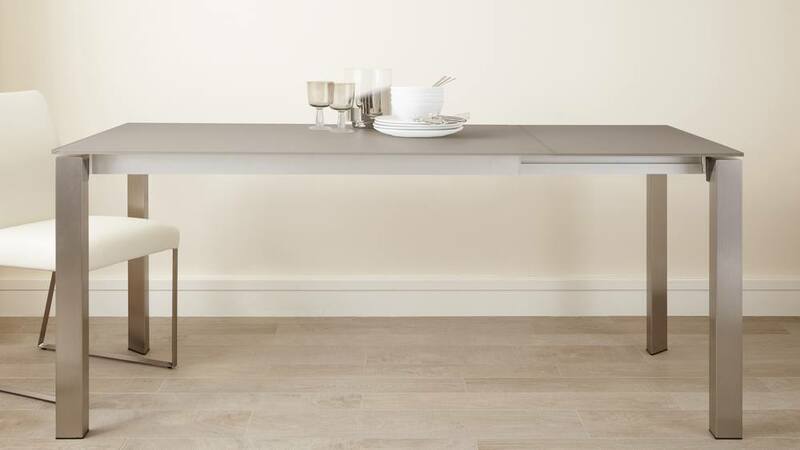 It is cleverly hidden within the design of the table, meaning that it doesn't disrupt its streamlined shape. It is also incredibly user friendly. 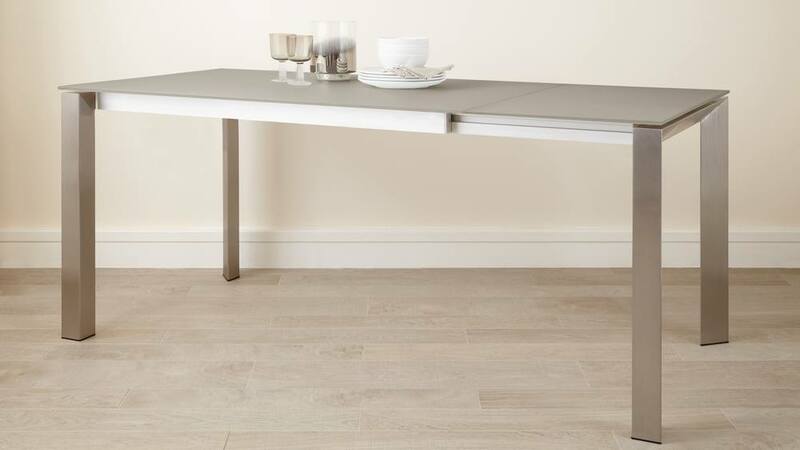 The Eve's table top is 10mm thick etched glass with a grey colouring. Etched glass won't chip or peel off as it isn't an applied finished. 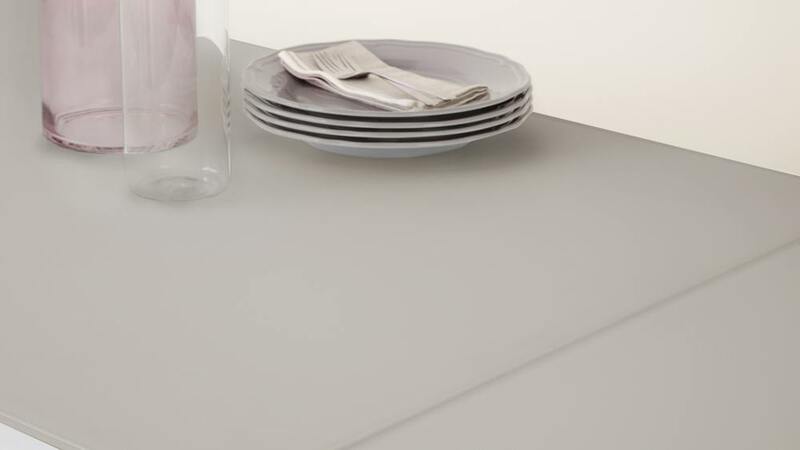 This means the frosted finish of the Eve table really is an integral part of the glass, making it incredibly durable. 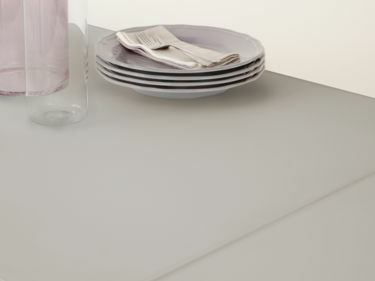 The glass we've used for our range of Eve tables is a tempered safety glass with a soft bevelled detail on the edges. This results in the table being extremely strong and sturdy, while also being very safe for you and your family. Because frosted glass has a matt appearance, it has a very absorbing look about it. It's a very forgiving finish as it won't show fingerprints. This makes it perfect for busy mealtimes, as you don't have to worry about constantly cleaning the table to keep it looking its best. The legs of the Eve are an upside down U shape with an inverted 45° sculpted angular detail, while the leg frame itself tucks neatly under the glass table top. The benefit of this is that you get a nice considered design detail on the leg that doesn't interrupt the smooth glass finish on the top. The legs are finished in a brushed stainless steel. 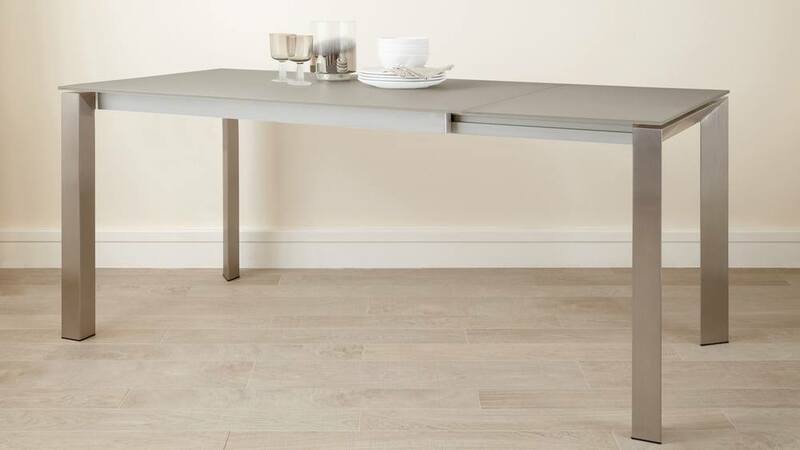 This gives the legs a matt appearance, which beautifully coordinates with the finish of the table top. A brushed metal finish is great for coordinating with chairs or accent hardware, which is a common feature in kitchens. So if you want to, you can easily create a coordinated look. Please note that the locking mechanism has been updated from what is shown in the video, the mechanism is now neatly hidden on the inside of the frame. Please enquire if you require further details. 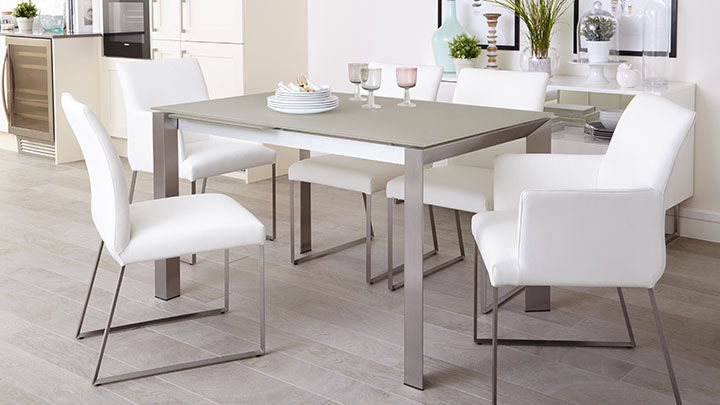 The Eve Frosted Glass Extending Dining Table in Grey and Brushed really is a designer looking piece. It is ideal for pairing with dining armchairs as the table allows the space for a slightly wider design of seat. The Monti Dining Armchair for example, is a stylish dining armchair that will really complete the designer look of the Eve dining table.